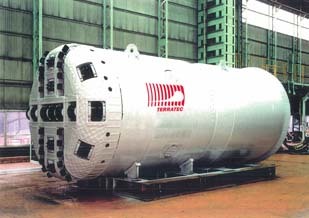 During the last twenty years, TERRATEC has been providing Hard Rock Tunnel Boring Machines for different types of geological conditions, from soft shale to extreme hard and abrasive quartzite. The Open TBM is the most traditional among the Hard Rock TBMs and is the fastest and most effective to bore tunnels in healthy Hard Rock formations. 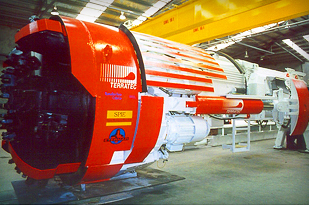 During the boring operation, the rear part of this TBM, called the Gripper Device, is firmly anchored to the tunnel walls by two large gripper pads while the front part of the TBM, containing the CutterHead, is extended by the action of 2 or 4 hydraulic cylinders called the Propel or Thrust Cylinders. For those rock formations containing unstable or faulty zones, using a Double Shield TBM is the safest and most efficient way to excavate tunnels. Double Shield TBM propulsion is achieved also by using a Gripper Device, but in difference from the Open TBM, the Front and Rear parts of the TBM are completely shielded. The TBM installs a concrete lining ring formed by precast segments to perfectly protect the tunnel from the surrounding ground as the CutterHead excavates, allowing excellent advance rates. When rock strength is low and the tunnel walls cannot react against the action of the Gripper Pads, the excavation of the Rock has to be done with a Single Shield TBM. 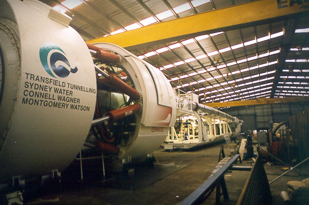 The Single Shield TBM reacts against the concrete lining ring to advance forward, and due to this, installation of Segments and excavation cannot be done simultaneously.